Took your advice and now have an external hard drive, but, I do not know how to do a mirror image, you two are so great I am sure you can help me and others that are confused on what to do. Thank you for all you do, and the that little case for the flash drive is a super idea!!! Thanks for your nice comments, and for your support! Making a hard drive clone or mirror-image backup, is easy, but how you do it depends on what software program you use to create the mirror image backup. There are two free ones we recommend, Paragon and Drive Image XML. Of the two, Paragon is the easiest to use; it’s better because it makes it easier to restore your hard drive when you need to. Each of these programs come with excellent documentation and each works in a similar way. Both Paragon and Drive Image XML have simple interfaces. Both pretty easy to understand. If you want to backup your hard drive (mirror-image) you tell it which drive you want to back up (usually C:\) and then tell it where you want to store your backup – your external hard drive. Then you click the backup button and the backup process begins. Depending on how much data you have, the backup process can take several hours or more. With Drive Image XML you can continue to use your computer while he backup is made. While Paragon says you can do this, we’d not recommend using your computer during the backup process simply because it increases the time it takes to finish backing up your computer. For you, we’d recommend Paragon because it makes it easier to create that all-important book disk (rescue disk) and it has several very helpful wizards that really come in handy if you need help. Paragon is a 95MB download, so if you don’t have a high-speed connection that might be a deal-killer. DriveImage XML is less than a 2MB download, so no problem there, if you don’t have a high-speed Internet connection. You’ll have to read the documentation carefully with DriveImage XML, because making a boot (or rescue) disk with it is not a simple task. Paragon would be our choice for you, if you have a high-speed internet connection (it’s a 95MB download). Paragon makes creating hard drive clones (mirror-image backups) as easy with the helpful wizards included with Paragon. 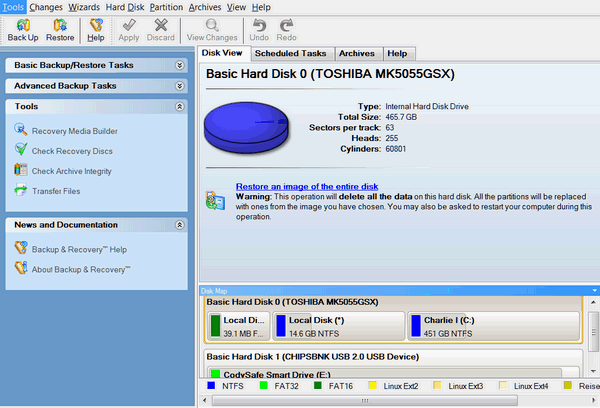 Also creating that all important boot disk – or rescue disk, is very easy with Paragon. As you can see from the screenshot below, creating the boot disk (called “Recovery Media”) is just a click away. Also you’ll note on its toolbar, the Wizards are there to help you should you need a little help. You can learn more about and/or download Paragon from here. If you want to read more about DriveImage XML, you can do that here. Both are free for personal/home use. Let us know how you did with your first mirror-image back up! We did and it’s a useful program. It’s just we like the other two better. They all work. Paragon free does not do incremental backups, but DriveImage XML does. I haven’t used Macrium Reflex in a long while – I normally use the paid version of Paragon which does include incremental backups – but I used the free version of it and have restored many computers with it…so I know the free version works well. Hi,l have followed your advice and downloaded paragon (redirected to c-net.com) just thought you would like to know the d/load bundled “Babylon” toolbar for I/E and hijacked my homepage on Google.It turned off S-A-S pro’s protect my homepage and notify settings.Not a problem just annoying and l know you have complained about these hidden bundling before.There were no check boxes to tick/untick.Thank you for all of your tips past and present Dave.